The improved Berkey Shower Filter™ unit will typically last 20,000 gallons or one year, whichever comes first. While testing was performed under standard laboratory conditions, actual performance may vary. The Berkey Shower Filter™ unit contains a new and improved shower filtration media, which is most effective in reducing free chlorine, hydrogen sulfide, scale and iron oxide (rust water). 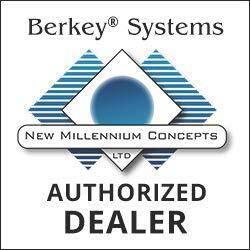 The Berkey Shower Filter™ process media works in a wide range of temperatures with a maximum operating temperature of 120 degrees Fahrenheit. Using a patented blend of high-purity calcium, copper and zinc; the Berkey Shower Filter™ unit works on a similar principle to a Catalytic Converter in an automobile. In shower filtration free-chlorine is converted into a harmless chloride. The scientific name for this chemical reaction is known as "Reduction-Oxidation", commonly referred to as Redox. Redox reactions can be chemically complex. Simply stated, during a Redox reaction electrons are transferred between molecules, creating new elements. For instance, when free-chlorine comes in contact with the filtration media, it is changed into a benign water-soluble chloride. This reaction changes free-chlorine to a larger chloride element. This is too large to evaporate or be absorbed by the skin. It is then carried harmlessly through the water supply.